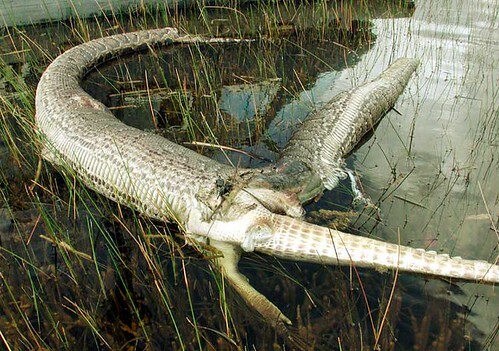 A python in Florida’s Everglades National Park (U.S) clashed with a 6-foot-long alligator and eventually subdued it in its muscular coils and as its wont, swallowed gator whole – almost. But then before the digestive system could smother the descendant of the Jurassic era inside its stomach, Bang!, the python’s middle parts exploded. Both perished in the process! Thus goes the story of a 13-foot Burmese python which was found with the carcass of a 6-foot American alligator protruding from its midsection. Its stomach still surrounded the alligator’s head, shoulders, and forelimbs. The remains were discovered and photographed on Sept. 26, 2005 by a helicopter pilot and wildlife researcher Michael Barron. It is not enough that you succeed; others must fail.